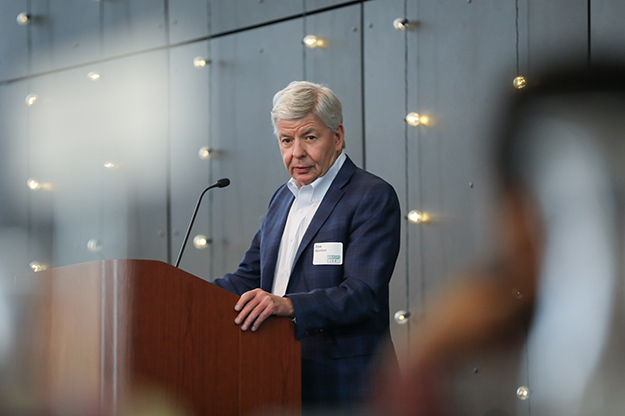 Dale Morrison, who has held executive positions at several Fortune 500 companies over the years, addresses a crowd at a recent UND leadership summit that bears his name. He is a UND College of Business & Public Administration alumnus and co-founder of the private equity firm TriPointe Capital Partners. Photo by Shawna Schill. Small groups of business attire-clad UND students scurried around the outer edges of the Gorecki Alumni Center, chatting about visual puns posted to the walls. One young woman pointed to the image of a box of Cheerios with a knife-wielding hand popping out of it. “Is it ‘serial killer’?” she asked the rest of her group, answered by their approving nods. This exercise wasn’t just a game—it was a test of the students’ ability to fit their leadership and teamwork skills into a brand new context. Nearly 70 undergraduate and graduate students gathered on April 19 for the sixth annual Morrison Leadership Summit, an invitation-only networking and development experience organized collaboratively by the UND College of Business and Public Administration (CoBPA) and the College of Arts and Sciences. Students from both colleges were nominated to attend by faculty and staff who recognized their leadership potential. “The summit celebrates the concept of leadership and pushes students to think about how they are leaders, and how they can continue to thrive and learn as leaders,” said College of Arts and Sciences Dean Debbie Storrs, who organized the first interactive session of the day. Once the teams had solved all of the puzzles and returned to their tables, Storrs led a vibrant discussion about what the activity taught them about the importance of shared leadership. “If you’re a humble and effective leader, you understand you don’t have all of the answers, and you have to able to build a team of leaders,” Storrs told her audience, setting the tone for the remainder of the day’s events. The summit coincided with day one of Interim CoBPA Dean Steve Light’s new role with the college. Students were not only able to network with those from other majors, but also alumni and friends of the University who have found leadership roles in the community. The summit invited nine business and non-profit leaders to participate in roundtable discussions about their experiences. 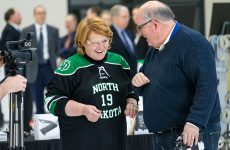 UND President Mark Kennedy was this year’s keynote speaker for the Morrison Leadership Summit, held at the Gorecki Alumni Center on campus. Photo by Shawna Schill. 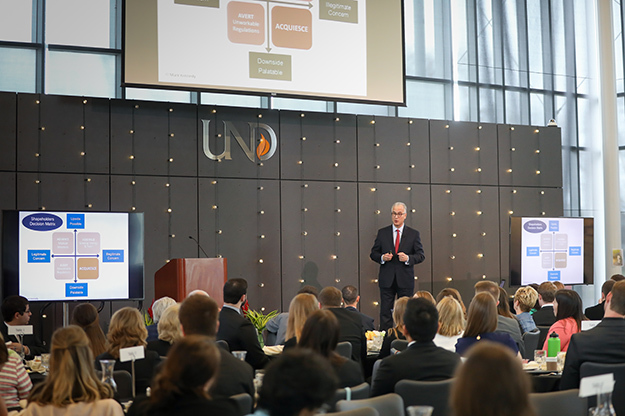 Following time for lunch and networking, UND President Mark Kennedy delivered a photographic keynote address using personal snapshots of his global travels. Kennedy explained the power shapeholders (regulators, the media, social and political activists, etc.) hold over the reputation and progress of organizations, and how good leadership can avoid potential conflicts. “Most businesses … say, ‘These politicians, these activists, these reporters—they just don’t understand me.’ And that’s true. But most business leaders don’t understand politicians or activists or reporters themselves,” Kennedy said. 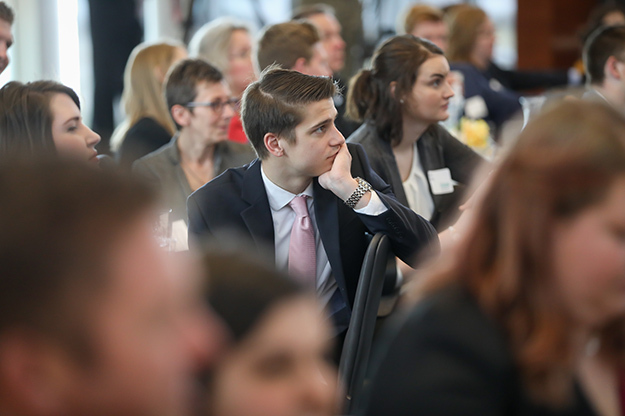 UND students listen intently to speakers at this year’s Morrison Leadership Summit at the Gorecki Alumni Center. Photo by Shawna Schill. It wouldn’t be a Morrison Leadership Summit without the powerful presence of the namesake himself. Dale Morrison took the stage to roaring applause, and was unable to hide his delight for the day. Morrison is a CoBPA alumnus and co-founder of the private equity firm TriPointe Capital Partners. 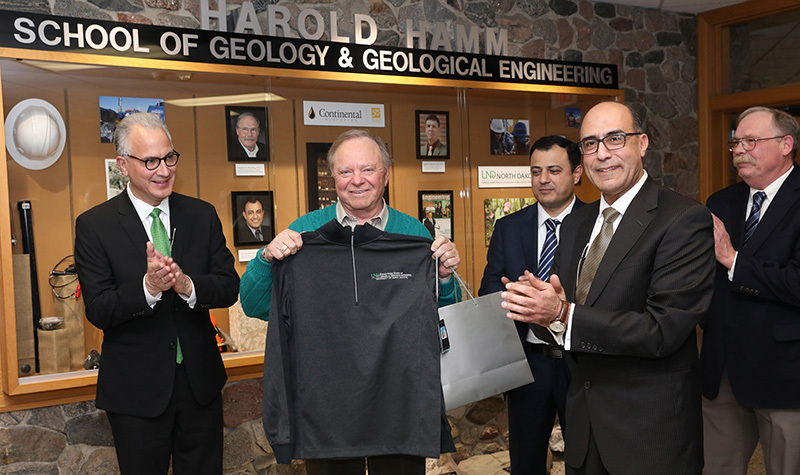 He also currently serves as chairman of the UND Center for Innovation Foundation. 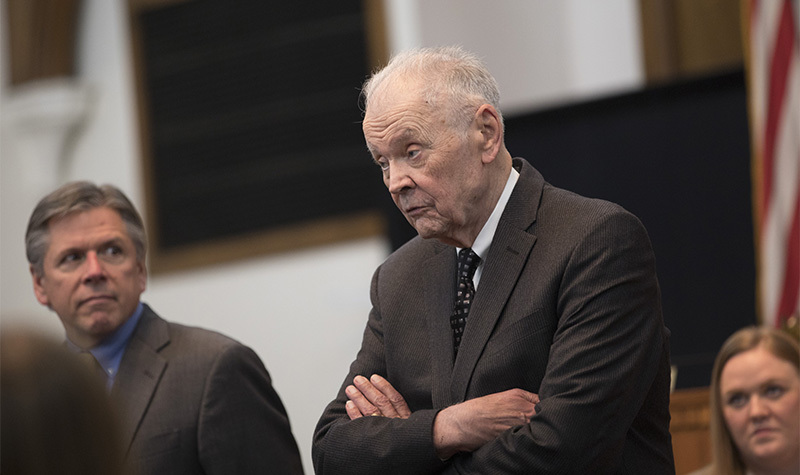 The first Morrison Leadership Summit was held in 2012, established with a generous endowment from McCain Foods, where Morrison served as president and CEO for seven years. Before McCain Foods, Morrison held notable roles with General Foods, PepsiCo and Campbell Soup Company. And since the beginning, he has never missed a summit. The College of Business and Public Administration and the College of Arts and Sciences extend a special thank you to Laura Arneson, Tanya Butler and Dale Morrison for their efforts in organizing this summit.